-You can now again boot from and access real CD's in 64 bit Windows hosts, and the cdenable.sys driver is no longer needed in 32 bit hosts (but can still be used). -SheepShaver might crash with low memory settings. -SheepShaver might crash when an audio CD is in the drive at start. -SheepShaver will only boot from CD when no Mac OS system is found on any hard disk image attached, even when set to boot from CD. -Audio CD's start play automatically, but without sound. Turn auto play off in Quicktime settings to prevent SheepShaver taking control over the drive and not release it when shutting down. -For hybrid Audio/Data CD's only the audio part shows. Please report you experiences with this build in the forum. -You can now switch between windowed and full screen modes by using the Ctrl+Enter key combination. All thanks go to our member vasi. SheepShaver for Windows (28-03-2012), fixed for certain Ambrosia games. If the included sheepshaver.exe gives you memory problems on i5 or i7 processors, replace it with the sheepshaver version from the 30-08-2010 download. -Gamma ramp patch to allow running certain Ambrosia (and possibly other) games. (30-08-2010):Startup sound has been enabled for a file called "boing.wav" in the SheepShaver folder. -The timer code has been changed to allow running software that requires more timer slots like the AppleShare IP server sofware. Last edited by Cat_7 on Mon Mar 02, 2015 7:38 am, edited 26 times in total. I'm trying it right now... but it would be nice to know what are some of the major changes you've made to this update, that way we can all skip right ahead to trying those aspects out. 1) ZOMG!!!!! FREAKING HELL YEAH!!! Choosing a color from the swatches in Photoshop actually works correctly now! The color I want is the color I get (and not the color underneath it, as in previous builds)! I LOVE YOU! Please try the latest build linked to in the first post and see if there is any improvement related to the restart error. Well, everything works so far. There was just-in-time error when I tried to shutdown with Pause/Break keyboard key (which is set as Mac "Power" key in my keycodes.txt), but I found it's a SDL.dll (1.2.13) issue. Changing sdl.dll back to 1.2.10 resolved this problem. Thank you Cat_7 for this new Windows release! There was no such thing in last two years. Last edited by boyanml on Fri Aug 08, 2008 8:14 am, edited 1 time in total. 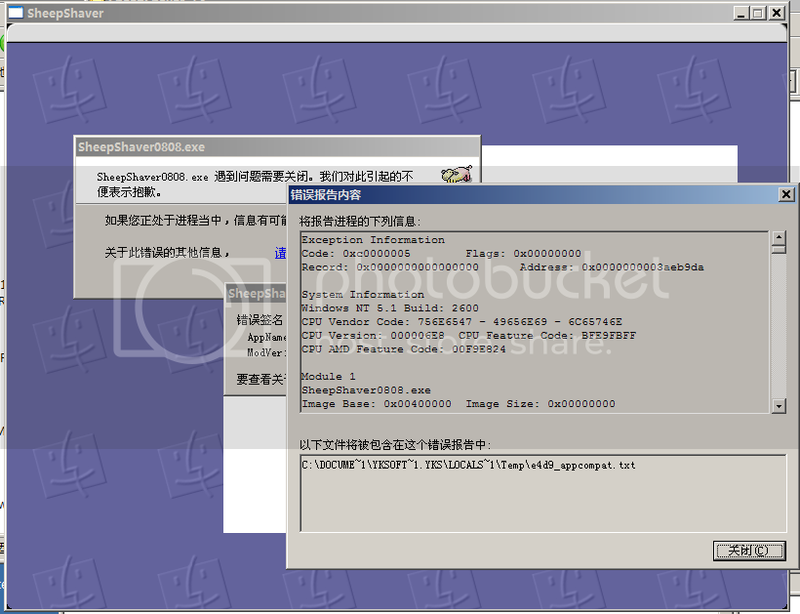 I have now included SDL.dll 1.2.10 in the download package. I have swapped the old sdl and exe files from my current install. Mac OS 9.0.4 starts to boot but as soon as the Mac background appears, right before the desktop icons appear, Sheepshaver just quits with no error message at all. I have tried starting without extensions, zap pram, 256 to millions of color, no change. 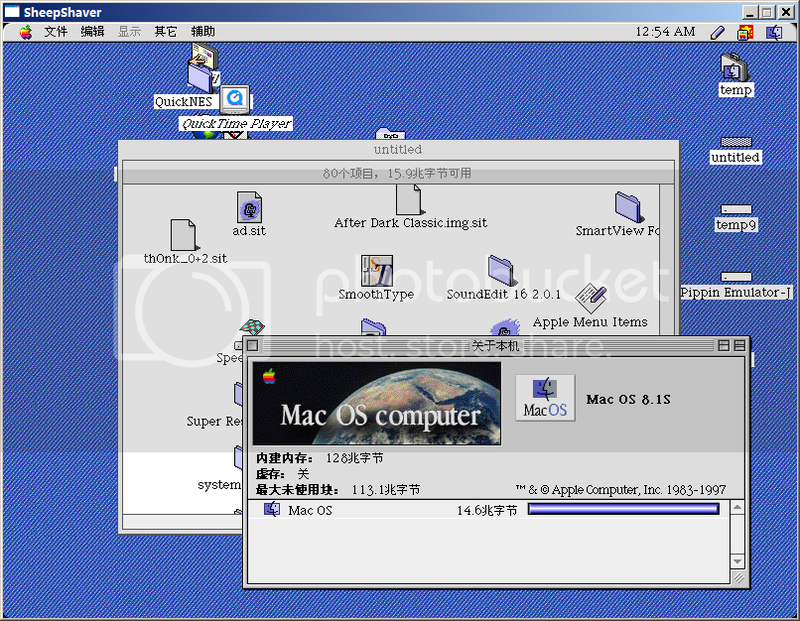 I even called up my backup fresh install of Mac OS 9.0.4 still same issue. This is happening on Vista sp1 and XP sp2. If I put the old sdl and exe files back, it boots fine. That is the same error I had before, but only when restarting (also in Vista SP1). It was fixed using the correct SDL.dll. I don't believe the error is in the pram file or your mac os install. You might try some different versions of SDL.dll. 1. Disable JIT. This works but emulation becomes too slow. 2. Set memory to 512 or above. It now boots up but cannot restart within Mac OS (Sheepshaver just quits). Cool! Microsoft Office (Word, Excel) works under Mac OS 9.0.4. I can create and save documents. But I have to turn JIT off to get SS to go all the way to the desktop without crashing. Me too I get the same bug ! I've tried using differend SDL packages ! But I am obliged to disable JIT to get OS9 booting ! Without JIT SS is useless as it is too slow ! Maybe there's still another version of SDL that bypasses this bug, but none I tried were succesfull ! Pitty though, cause would be terrific ss running stable on windows ! Oh and framemaker used to work early version sheep, now i get an Visual C++ error at startup ! have you tried setting memory to 512 Mb? It should allow booting and restart with JIT enabled. Thx Cat, setting memory to 512 did the trick even with JIT enabled, but as said before when I try running framemaker 7.0 it gives me a microsoft visaul c++ error en sheep quits, the application worked with the earlier sheep version though! My screenshots for the new 0808 SSWin, all using a rom from a 8500. 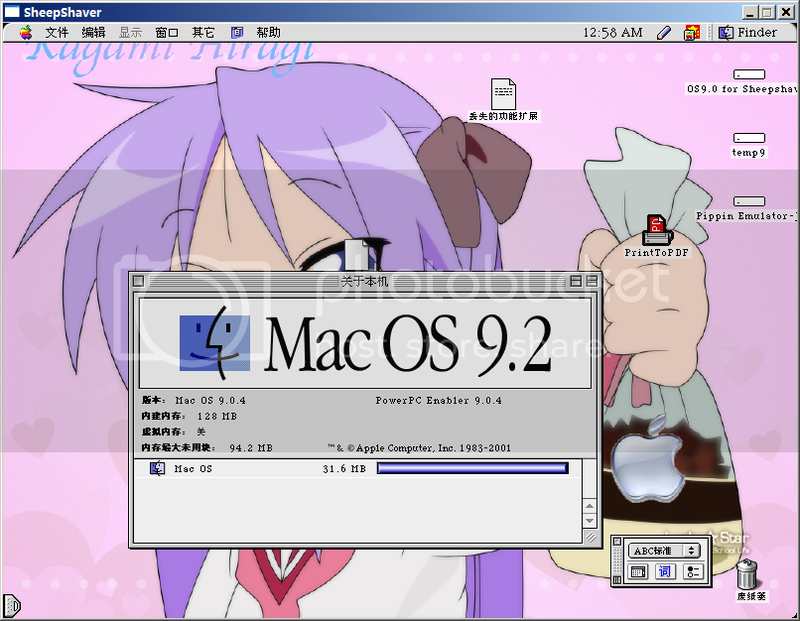 Using Mac OS ROM from 8.6 or Mac OS ROM Update 1.0 with 9.0 or 9.0.4 will crash SS when starting Finder. however If you try to start 9.0.4 with Mac OS ROM.... Bang! What a terrible crash to have Jobs' curse! I had a similar problem mentioned above about SS closing for no reason during boot-up. 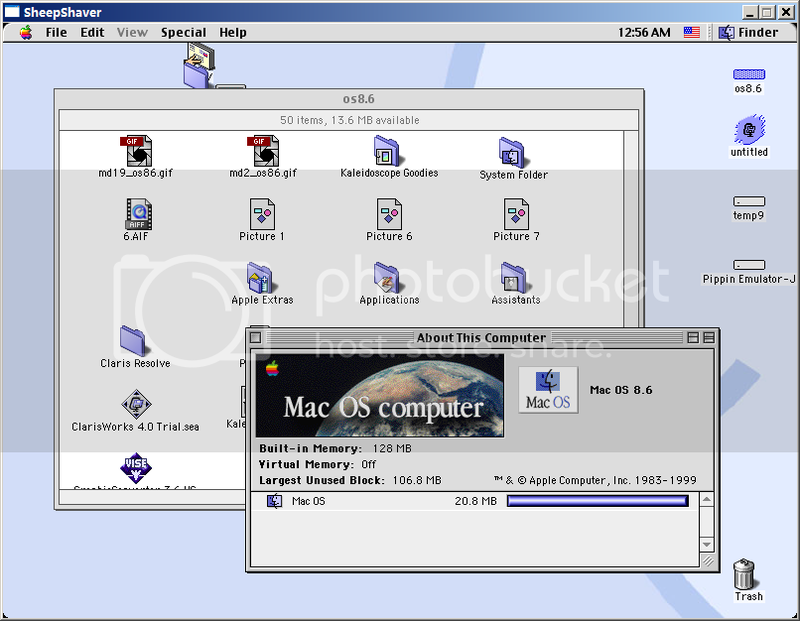 Using Basilisk II, I created a boot 7.6 image (no extensions, no control panels, etc., which I use with SS to install OS 7.6 to another image. I am able to boot to the boot image no problem, and install 7.6 no problem. However, when booting from the image where I fully installed 7.6, Mac OS loads about third/half way with the extensions before closing for no reason and with no error message. The same occured for both the previous SS build and this one. And no, I can't switch to 512 MB of RAM, since I only have 512 MB of RAM on my computer. I need help with my emulator. I know alot about computers, but have never seen this nessage before. I needed to download a bunch of DLL's for it to come up with the error. It comes up saying "The procedure entry point gtk_file_selection_get_filename_utf8 could not be located in the dynamic link library libgtk-win32-2.0-0.dll." Please help. That will tell you what you need to install to make the emulator work. Can I use this latest version, even if I am under MacOS 8.6 in SheepShaver? - a 258048 octets "SDL.dll" file; this one is intended to replace the 1702125 one I already have in my Sheepshaver folder? - a "Mac OS ROM_iMAC" file; is it a Macintosh ROM file I must use with this version of SS, in replacement of the ROM file I currently use? Hardware products, call for our free Catalog. I downloaded this build and tried to use it on the MacBook. I renamed the ".exe" ".dmg" but that didn't work. The finder tells me that there is no volume to mount. See the subject of this thread. This is SheepShaver for Windows, not SheepShaver for MacOSX. I'm using XP Pro SP3. Having the same problem with SheepShaver as others. It launches, gets to the Welcome to Macintosh splash then quits. I'm using the latest build from the post at the top of this thread with the iMac ROM and the SDL dll from the older release. Prior to this I tried the old 'official' build from 2006, same exact launch and die issue. Does it just not work at all with a System for any Mac install of 8.1? I don't have a PPC bootable CD for any versions other than 9.1 and various versions of OS X, so I used my Apple Legacy Recovery CD-ROM to install a FAT 8.1 to an HFS+ image using Basilisk II. Both the old Lauri Pesonen build and the JIT builds of Basilisk II run just fine. I could try using that to update the GigaSheep (it's a 1 gig HFV) image to Mac OS 8.6.